Posted December 4, 2018 at 12:15 am . 4 comments. 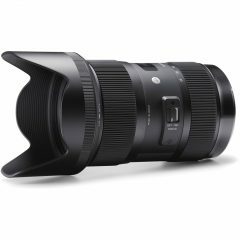 Today’s B&H DealZone (one-day deal) features the Sigma Art 18-35mm f/1.8 DC HSM for Canon for $549.00. Save $250 from the regular price of $799. You also get an 4% B&H reward towards a future purchase at B&H! This is the lowest price seen yet for this stellar lens. If you have a crop sensor camera, this is a MUST lens for you to own. It is very, very sharp and it is the only zoom lens in the world with a 1.8 constant aperture. I paired this with my Canon 80D and used it for shooting events up until I switched over to Full Frame bodies. The main downside is that it is heavy compared to most EF-S lenses, but the sharpness and quality of the pictures make up for it. P.S. I bought this for $799 when it first came out and even for that price, it was a great bargain. For $549, it is a no brainer! Splitting hairs, but it’s not the only F1.8 zoom. Sigma has a 50-100mm F1.8 also, and it is also pretty good. Optically, this is one of the sharpest zooms ever made, often is compared to primes for sharpness. Really wish it had more reliable AF, but even then 550 is a really good deal on this popular lens, and the 4% rewards is a nice bonus. I want Canon to steal this design, along with the 50-100mm F1.8, and give them either STM focus or Nano-USM, so that they would be useful for video, which I think would be their biggest draw. And when you consider the R adaptors allow for the use of EF-S lenses, well, I think it makes more sense now more than ever for them to allow for this kind of support. That crop in 4K is pretty big, and a Canon version of this lens would give the R a pretty big advantage with DPAF and silent, smooth focusing with reliable AF performance. I would bet they could even squeeze in IS. Another thing to note, Sigma doesn’t make a different mount for DC or DG, that only determines the size of the image circle that is projected by the lens. So this lens will fit on a full frame camera too. While I wouldn’t suggest it for stills, I would say it’s an interesting option for 4K shooting on a 5D, also due to the large crop. Just not sure about that AF performance, also I don’t know if it is noisey for video. Just thought I would throw that info out there.